The Cova Eirós site is located in Cancelo (Triacastela, Lugo). The cave entrance is on the NNW slope of Monte Penedo in Serra do Ouribio, 780 metres asl. The cave is 104 metres long, with a mouth that currently measures 2 metres high by 3.5 metres wide. In the late 1980s, several digs in the middle and end sections of the cave provided approx. 4,000 bones from at least 43 bears. Based on these findings, Cova Eirós became one of the most important sites on the Iberian Peninsula for Ursus spelaeus remains. In 1993, the first archaeological dig in Cova Eirós was a 1m2 test pit at the cave entrance, in which five archaeological levels were identified and initially attributed to the Middle and Upper Palaeolithic. Following these reports, in 2008 a new phase in the exploration of the Cova Eirós occupations was begun. As a consequence of this new excavations, two levels attributed to the Middle Palaeolithic (levels 3 and 4) have been identified in the lower part of the sequence. These Middle Palaeolithic lithic assemblages are characetrized by the use of quartz, with quartzite playing a secondary role. The features of the lithic assemblage of Level 3 suggest a differential management of lithic resources, defined particularly by the relationship of Levallois method to fine-grained quartzite and the use of more expeditious methods with quartz, although quartz Levallois products have also been found. Functional analysis of this assemblage has identified hunting-related activities (broken spear tips), butchering and hide treatment at the site. The faunal assemblages of the Middle Paleolithic levels is characterized by a high percentage of fragmentation. Some bones show clear cut marks and fractures, pointing to the anthropic factor as the main agent in butchering-related activities, skinning and access to bone marrow. There is one OSL dating for Level 3: 84.807 ± 4919 BP. Levels 1, 2 and B have been ascribed to the Upper Palaeolithic. The level 2 contains a high percentage of small-sized quartz industry. Although the type of raw material and the large number of knapping fragments hinder an accurate techno-typological definition, certain changes in the supply strategies —with the appearance of small amounts of rock crystal and flint— and the presence of blade items in rock crystal permit this assemblage to be attributed to the initial Upper Palaeolithic. AMS C14 dating ( 31690 ± 240 BP) situates these occupations in the Aurignacian. The faunal record includes Cervus elaphus and Capreolus capreolus and a remarkable representation of carnivores, The faunal remains show a high level of fragmentation and some have obvious cut marks and fresh fracture. The top of level 1 was dated by OSL to about 17.000 years BP. The lithic assemblage of this level is characterized by the use of quartz, while flint and rock crystal have a greater representation in comparison with older levels, parallel to an increased blade and bladelet component. The technical nature of the assemblage and the datings currently available ascribe this level to the end of the Gravettian. As to the the faunal assemblage, Rupicapra rupicapra and Cervus elaphus still predominate amongst the herbivore species, but there is a significant decrease in the carnivores with respect to the previous levels. The lithic assemblage of Level B shows a clear specialization, with a high percentage (40.6 %) of rock crystal, second only to quartz. There are two different chaines opératoires in the reduction strategies: the production of flakes in quartz and quartzite with longitudinal, orthogonal and, to a lesser extent, bipolar techniques; and on the other hand, specialized production focused on the exploitation of rock crystal prisms for bladelets and backed elements. Faunal remains -including a deer antler- are quite scarce, possibly due to the more organic component of the sediment. Radiocarbon dating places this event right at the end of the Magdalenian (C14 AMS: 12.060 ± 50 BP). 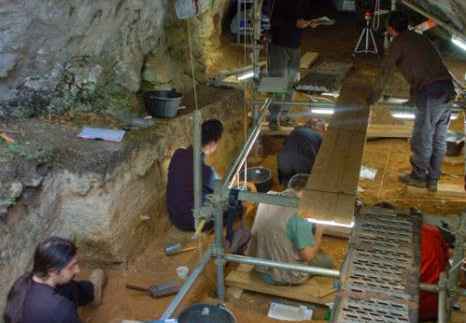 While most of the identified occupations at the site have been ascribed to various periods in the Middle and Upper Palaeolithic, there is also evidence of this cave's use in subsequent periods. In recent prehistory, it was used as a burial site, judging by the Bell-beaker ceramic material recovered at the entrance, and the human remains found inside the cave, dated to the Bronze Age (3151 ±31 BP). Moreover, in 2011 several paintings and engravings were discovered inside Cova Eirós, the first Palaeolithic rock art detected in north-western Iberia. The ongoing characterization, classification and dating work of these motifs will permit a precise definition of the chrono-cultural coordinates of these Palaeolithic expressions. Eleven decorated panels have been identified to date. One of the features of the series —also a constraint for their study— is the poor state of the images due to heavy washing of the paintings and also the large amount of recent graffiti which has affected many of the motifs. To summarize, Cova Eirós site contains the most complete stratigraphic sequence now available for the study of the Middle and Upper Palaeolithic in Galicia. It permits a direct comparison of evolving technologies, subsistence strategies, adaptation to and exploitation of the territory between the Neanderthals and the H. sapiens of north-western Iberia. Cova Eirós is a reference point in the reconstruction of the evolution of the habitation of Galicia's eastern ranges (Serras Orientais) and the relationship to the open air settlements and shelters in regions of north-western Iberia. The archaeological record and the cave art at this site point to a similarity and even convergence with historical processes identified along the Cantabrian Coast.